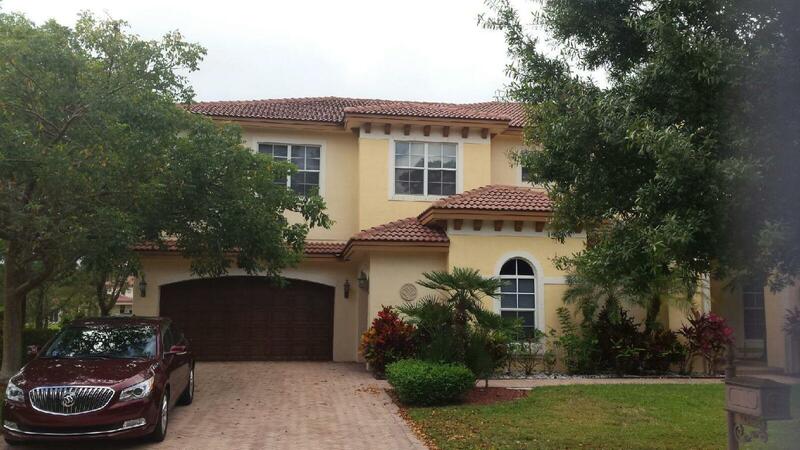 Florida Real Estate: Beautiful Home In Royal Palm On The Market! Come to the sun soaked city of Royal Palm Beach in Woodslanding! ''Quantum of Luxury within Palm Beach's Finest'' in this elegant Mediterranean style six bed room, six bathroom home generously laid out over four thousand and seven hundred square feet of perfectly appointed living space. This home boasts a chef's gourmet kitchen with over sized counter space, a center island, sleek granite counter tops, custom wooden cabinets and a full suite of designer stainless steel appliances.The walk in pantry is spacious. The laundry room is very large with ample cabinet space and a sink. The palatial patio overlooks the sparkling swimming pool and the tranquil lake. The summer kitchen has a designated grilling area with all the necessary equipment. The massive living room is perfect for hosting large gatherings. Dramatic soaring volume ceilings are another great feature of this home. The loft is perfect to relax in. There is an awesome balcony overlooking the heated pool and community lake. This home was built on a generous parcel of land. A ''Must See'' home. Only minutes from Palm Beach International Airport, the beautiful Wellington Mall, and sought-after downtown City Place.